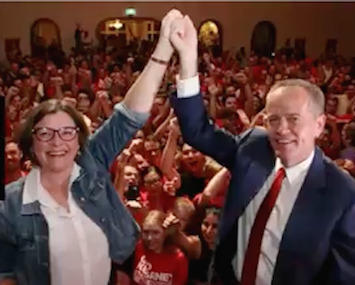 Labor candidate Ged Kearney and Opposition Leader Bill Shorten celebrate Batman by-election win (screen shot via YouTube). John Passant analyses Ged Kearney's Batman by-election win and what it says about left-wing policies. IN THE BATMAN BY-ELECTION on Saturday, former Australian Council of Trade Unions (ACTU) President Ged Kearney beat back a challenge from the Greens and retained the seat for the Labor Party (ALP). Readers will know that, as a socialist, I am no fan of either the ALP or the Greens. Neither, in my view, offer a left-wing vision let alone practice that would encourage me to join them. I also have no illusions in a parliamentary road to socialism. Parliament is an institution of capital and those who are elected to it by and large accept the logic of the profit system. The aim of most politicians is to form government — in other words, to manage capitalism. Parliament is, to borrow an image taken from later writers on Marx, "a band of hostile brothers". These "brothers" debate and discuss the way forward for capitalism. However, I believe, profound systemic and progressive change only really comes about through struggle, either on the streets or in the workplace. Bill Shorten thanks Batman voters for electing Ged Kearney (source: @billshortenmp). "What matters most is not who is sitting in the White House, but "who is sitting in" — and who is marching outside the White House, pushing for change." Such action puts pressure on governments to implement change for the benefit of workers. For example, protests, strikes and armed rebellion laid the basis for our current democracy. Elections can tell us much about the state of the working class and its understanding (or lack of understanding) of its own interests. In the 2016 Federal Election, Labor, with the right-wing apparatchik David Feeney as their candidate for Batman, won the seat 51 to 49%, on a two-party preferred basis, over Alex Bhathal from the Greens. On Saturday, Kearney, with a 78% turnout, won 54.6% of the vote on a two-party preferred basis, compared to 45.4% for the Greens. So, Ged Kearney has engineered a 3.6% two-party preferred swing to Labor in this by-election. The Liberals did not run a candidate. In 2016, their candidate won almost 20% of the vote. The swing on first preferences to Labor was 7.81% and 3.44% to the Greens. The Australian Conservatives, perhaps the home for Liberal voters unable to vote for their party, won only 6% of the vote, leaving almost 14% of the electorate – the rest of the 2016 Liberal voters – to find someone for whom to vote. Some of them may have stayed home as the voter turnout was only 78% — 11% less than 2016. The informal vote was 6% but that is almost 2% less than 2016. It appears that more traditional Liberal voters may have voted for Kearney compared to Bathal — preferring Labor to the Greens. What made Kearney such a good candidate? Well, it is generally accepted that the seat has been gentrifying and greening and that there is a Bell Street divide between the north with its Labor supporters and the south with Greens supporters — perhaps reflecting a worker/middle-class divide. The reality is that there was a big swing to Labor south of Bell Street and a small swing in some booths to the Greens above it. Kearney is a woman, a senior trade union official and is regarded as progressive on issues like refugees, climate change and industrial relations. In other words, the ALP running a left-wing candidate won votes back in Green areas and kept the swing to the Greens in Labor areas fairly low and inconsistent. There is a lesson in this for both the Greens and the ALP: a left-wing candidate will attract votes. Who would have thought it? As Jeremy Corbyn and Bernie Sanders show, talking left wing, even mentioning socialism and backing that up with left-wing policies – and in Corbyn’s case, understanding you have to build a mobilised group prepared to fight for your policies – will increase the left vote. However, Jeremy Corbyn is writ very small in Australia because Labor here is dominated by right-wing apparatchiks at the parliamentary level and the membership has little control over parliamentarians, policy or its implementation. In my opinion, Shorten is one of those right-wing apparatchiks, but at least he had the brains to pick a candidate who would appeal to Batman voters. The Greens in Batman campaigned on Adani and similar environmental issues, but did not really address the bread and butter immediate class issues, like falling real wages and the inadequate funding of schools and hospitals. There was also internal dissent that became public and undermined Bhathal and her Party. On Adani, Labor walked both sides of the barbed wire fence. It too did not really address falling living standards and inadequate public schools and hospitals. That is the beauty of having a candidate like Kearney. Her previous role as ACTU president helps give the impression of addressing these bread and butter issues without the Labor Party having to outline any concrete ways of dealing with the everyday problems working class people – and others – face. The left in the ALP gives cover to the right wing and their policies. So it was, for example, that Kearney’s previous welcoming approach to refugees – a welcome she helped the ACTU come to as part of its policy development in 2015 – went missing during the Batman campaign. Kearney toed the party line. The Greens could have addressed this imbalance in class appeal by proclaiming left-wing economic policies in the style of Jeremy Corbyn — renationalising certain key industries, announcing a nation-building renewable energy program across Australia with well paid jobs, taxing the rich, spending much more on public schools and hospitals, lifting pensioners and welfare recipients out of poverty by increasing their payments by about $150 a week and so on. You cannot talk sensibly to many workers about refugees or climate change without first making sure they feel economically secure. And I believe such economic security can really only be won through class struggle. So, any part of a left-wing campaign must include the abolition of all restrictions on strikes and other industrial action, and direct action campaigns for basic economic and social spending justice. The Liberals’ scare campaign against Labor’s franking credit refund changes, which, because of inadequate thought and design has some truth to it for 14,000 pensioners and 200,000 part pensioners – on Labor’s own figures – did not resonate. Voters seemed to accept Shorten’s assertion that Labor would always deal with pensioners better than their opponents. Is there a lesson in Batman for the Greens? Why are the left still in the Greens? Is it time for them to split and orient to people in struggle? What about any lessons for Labor? Instead of faux leftism, give us a genuine radical program similar to Jeremy Corbyn, with a mass movement to back it up. Stay up to date. Subscribe to IA.